Rafter is constructed using sturdy aluminum to keep the fabric in tension and eliminates water pooling and noisy flapping caused by wind. Easy to install without damaging the awning. 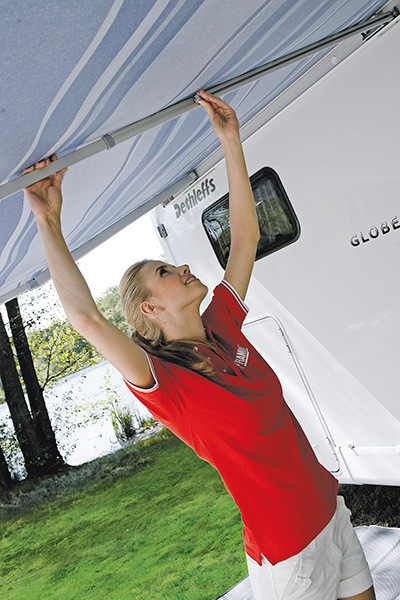 Works with most Fiamma F45, F45S, F65 & F65S awnings. Center rafter is included on F45S models 4.0m and larger, and F65S 4.0m models. Comes standard with special wall clips for a handy storage inside the vehicle. Complete with rubber ends so it can be installed on other awning brands. This rafter was an exact match to my damaged rafter! I was so happy to find one. My awning could be repaired, but the rafter was beyond repair. Well-designed rafter. Easy end connections. Supports the awning well. Easy to install or remove quickly. I bought the rafter to replace the original rafter which was damaged over many years if use. I made use of the mounting clips that came with the rafter and mounted it in a safe location. Works great, just like new.